Packt was so kind to hand their latest publication to me for a review. 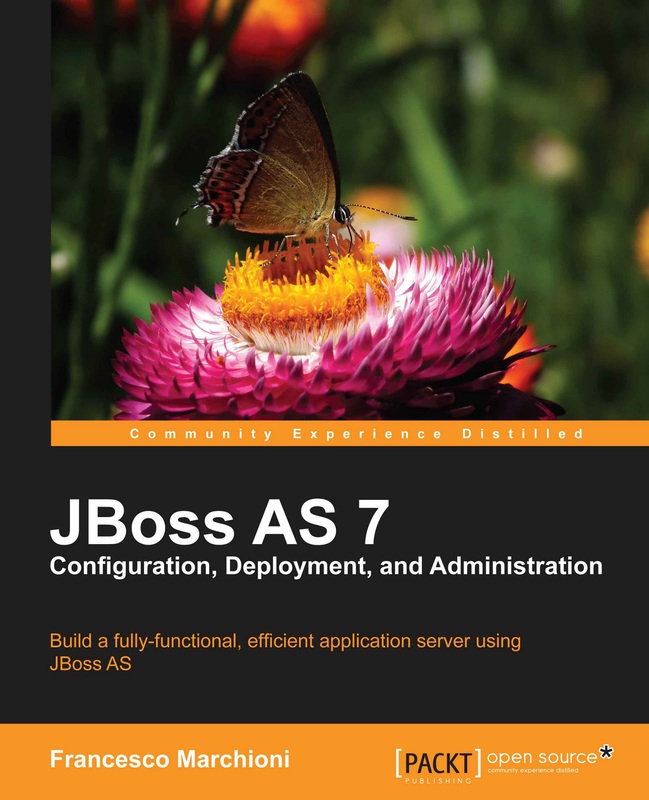 JBoss AS 7 Configuration, Deployment and Administration promises to give you an expert's understanding of the single components that makes up the JBoss application server. Showing you how to use them, helping you to cut down the learning curve for this exciting product and guide you through configuration, management, deployment and advanced administration of JBoss AS 7. Abstract: As the Java EE standard has evolved and matured, the API has become increasingly rich and complex. The next generation of application servers needs to be modular and configurable to run only specific services or containers. JBoss AS 7 promises to meet those requirements but the configuration of a complex application server is composed of a mix of administrative and management tasks which often overlap, generating confusion. Francesco Marchioni (@mastertheboss) is a Sun Certified Enterprise Architect employed by an Italian company based in Rome. He started learning Java in 1997, and since then he has followed the path to the newest Application Program Interfaces released by Sun. He joined the JBoss Community in 2000, when the application server was running the release 2.X. Over the last five years, he started authoring technical articles for O'Reilly Media and running an IT portal focused on JBoss products (http://www.mastertheboss.com). The book has 380 pages. Chapter one starts with page 26, chapter 11 sumary ends on page 333. That's not too much overhead and the main part actually cover good content. Chapter 1 is about installing JBoss AS 7. It gives a basic introduction to the new application server, depicting its most important features and shows how to install it on your machine. Chapter 2 covers the Application Server's configuration. Beside the main configuration file and some core parts of it, such as like the Thread pool configuration it also looks into the Logging subsystem. and dives into modeling the core Java Enterprise services using the standalone configuration file. and completes the standalone server configuration by looking at the Web subsystem. This chapter also covers a full Java EE example. and teaches the reader how to shape the domain server configuration and the criteria behind the choice of a standalone or domain server configuration. covers all the details of application deployment. A dive into class loading mechanism is also included. Covers the related management tools used to control the application server instances. All the AS 7 clustering capabilities that provide scalability and high availability to Java EE applications. Covers another concern of clustering, which is the ability to make several servers participate in the same service and do the same work. covers the foundation of JBoss Security framework and how to secure Enterprise applications and the server management interfaces. The mandatory chapter these days covers AS 7 and Red Hat OpenShift platform. The general writing is easy to follow, at least for non native speakers like me. I was also feeling very comfortable with the terms used through the book. So no big surprises if you are experienced in the Java EE area. Hints and extra information is placed at the suitable and helpful positions and I also like the examples (configuration and more) a lot. Most of the more complex stuff is additionally explained with images and concept drawings which is also very helpful. This book doesn't require any existing knowledge of AS7 and introduces you from the ground up. Nevertheless, there are hints about upgrading existing installations all over the book. So, it has a lot to offer for both experienced and beginners. The structure is good and beside the mandatory cloud chapter I really enjoyed reading and playing along with the examples. Also very appreciated is the fact that there is not too much Java EE source code in the book and the author really tries to focus on deployment and administration. So don't be afraid about having to read a complete Java EE 6 tutorial along the way. Another point to mention is, that this book is far more complete than any available online documentation today. Especially the clustering and load-balancing parts are very interesting to read and also cover the various load balancing mechanisms. You are with JBoss? Go with this book! Thanks for the review. I've been looking at this book for a while. The company I work for want to upgrade their version of JBoss. AS 7 still feels like unchartered territory.